We therefore recommend that if you want your lights to be dimmable that you purchase your bulbs and dimmer switch as a compatible set under the advice of a professional. 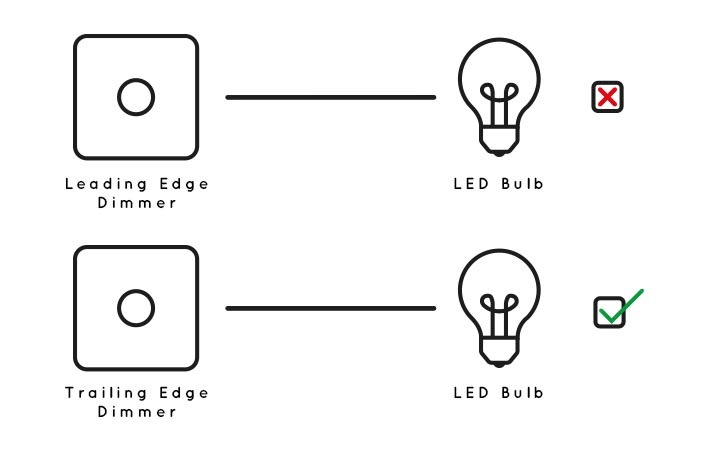 Incandescent Bulbs should be used with a traditional ‘Leading Edge’ dimmer. These dimmers were originally designed for use with incandescent and halogen lamps, therefore they have a high minimum load. This makes them incompatible with a lot of low energy light sources such as LEDs. Leading edge dimmer systems can also decrease the lifespan of your bulb. If you are using an LED Bulb, you will need a ‘Trailing Edge’ dimmer. These dimmers have several advantages over leading edge dimmers including smoother control, soft start and silent running when in operation. This helps to prolong the life of the bulb. Trailing edge dimmers have a much lower minimum load than leading edge, making them far more suitable for powering LEDs. If your dimmer switch is old, it is likely a leading edge and worth changing to a trailing edge version. Please consult your electrician for installation advice on whether your dimmer system is suitable for use with modern light sources. Having trouble with one of our LED bulbs? You could be either under-loading or overloading your dimmer. These are both fairly common issues when replacing old incandescent bulbs with LEDs. You need to check the minimum and maximum loads for your dimmer system and be sure that your new bulbs are compatible. If you have a leading edge dimmer, LED bulbs won’t meet the minimum wattage requirements so will flicker and fail. You will need to replace this with a new trailing edge system or use a higher wattage incandescent bulb. If you already have a trailing edge system, but your bulbs are still not working, the system may be overloaded. When a dimmers wattage capacity is defined, it does not take into account an LED bulbs higher efficiency. Therefore, you will need to divide the dimmers maximum wattage by 10 to get the relevant value for LED bulbs. 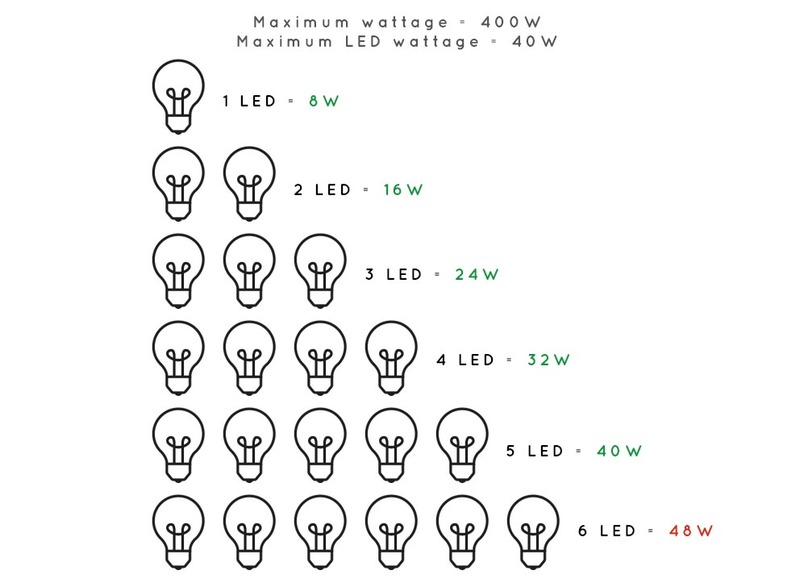 For example, if the maximum load is 400W, you will need to be sure that the combined wattage of your LED bulbs does not exceed 40W; the below graphic illustrates this point. Once you have confirmed that your bulbs are within the wattage requirements, you should be able to use them successfully. By applying the rule that the combined wattage of LEDs does not exceed 10% of the dimmers wattage capacity, you can determine the maximum amount of bulbs per dimmer system. In this case, any more than five of our 8W LED bulbs would overload the system. Please note that this guide is offered only as advice and we are not certified electricians. Please consult your electrician when installing dimmer systems to make sure that they are compatible with our bulbs.